PLEASE CHECK YOUR ORDER CAREFULLY BEFORE SUBMITTING !! !! !Once you place your order, it is not subject to cancellation or change. If you have any questions please email us or click the live help chat if available prior to placing your order. Be sure to give us accurate contact info including apartment # email address etc! Please NOTE: For ongoing spring events such as Communion / Confirmation, Dance Recitals and Graduation, please try to order at least 3 weeks prior to your need by date. In house rush helps to move your order to the art department quicker. It can sometimes help bump up your production as well. At our discretion we may also use your in house rush funds to upgrade your shipping. During the holidays it behooves you to choose in house rush along with any upgraded shipping within your budget. Our image upload system emails your photo / graphic to us. Some email servers stop the transmission, so there are times we will not receive your graphic. IMPORTANT Notice: Please do not send us images that you have taken from the internet. 1- they are not print quality 2- they are not in public domain and we will not print them. Unless you have purchased rights to use an image or have gotten them from a royalty free site or have taken the image yourself we are unable to reproduce the image. Do Not request any trademarked images such as ball teams, Harley Davidson, John Deere, Disney, Fan Art etc etc etc. The same applies to any text requested. Do not request names of ball teams, automobiles, etc etc. Sending these types of images or requesting such text will hold up your order and result in penalty fees if you cancel! In the event of extenuating circumstances and you must cancel, penalty charges will apply. Cancellation penalty if artwork has not yet been done is 10% of your total order +$ 3.50 which will be deducted from your refund amount. If artwork has been done for the product, 25% will be deducted from your refund. If a print has been made 40% will be deducted. If your item has already been created 80% will be deducted. **We also do not print pornographic or low quality poor resolution images or images taken from the internet. Our Image submission guidelines are clearly stated. If you submit one of the above and then cancel your order because we are not able to print it, then there will be a 10% penalty deducted from your refund. Please read guidelines carefully and do not submit such images. We reserve the right to cancel your order for any reason. We reserve the right to refuse orders that are of an adult or pornographic nature. We reserve the right to refuse orders that are in a different language if we cannot find the meaning, or find the meaning to be inappropriate. We reserve the right to refuse orders from out of the United States. We will not ship to a freight forwarder. Guarantee: We guarantee our work, however, personalized products cannot be returned or refunded. In the event of an issue that is our error, products will be replaced. Any item that is damaged in shipping can be exchanged for an identical item with the same personalization. However, a claim must be made with the freight carrier. Please check shopping cart carefully for accuracy before submitting as personalized products cannot be returned or refunded. Click the category links on the left or top to open each category and navigate to your desired item. Custom or Personalized License Plates for Bicycles are a great gift for children and adults!.��Bike plates are great as a gift for every child. Add a novelty Bicycle License or Battery powered vehicle license and you've got a great gift. They make great favors for kid's parties as well as birthday and holiday gifts. The Adults love them for Bikes, Golf Carts, Walkers, Wheel Chairs, Shopping and Mail Room Carts. 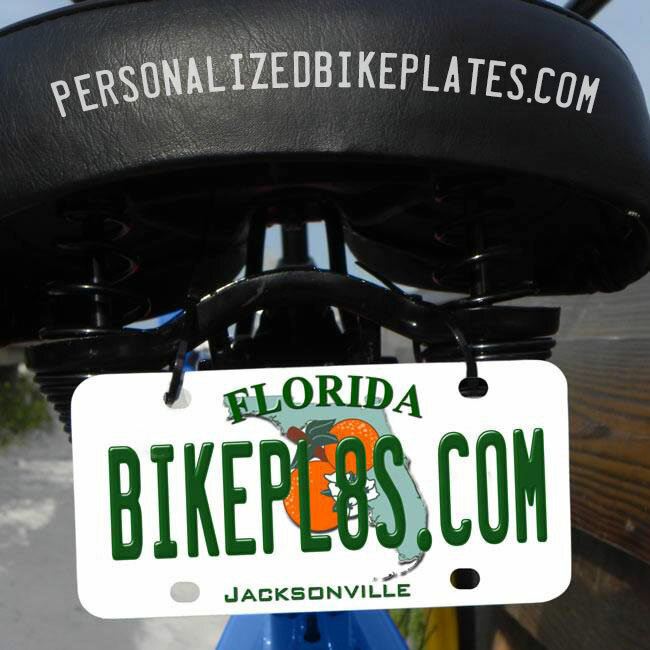 Our Bike Plates are made from either solid polymer fiberglass - plastic, and are approximately 3/16 thick, or aluminum,. We offer a variety of sizes New Mini Plate Series -2x4, 2.5x4, and our all new 2.25 x 4 plate that comes with a black frame. Standard size bike plates- 3x6, ATV and Motorcycle Plates- 4x7 and Car Tag Size- 6x12. (only 3x6 4 hole plates are offered in plastic - all sizes are offered in aluminum). All Plates are rust resistant, perfectly flat, Printed in full color. with no set up charges! Plates are shipped with 2 zip ties for application except when used as a desk accessory.